To the National Gallery, where civilisation seems once again to have gained the upper hand in the war against the forces of darkness. Hurrah! When the current director of the gallery, Nicholas Penny, took over from the overly commercial Charles Saumarez Smith — on whose watch the National had begun selling postcards of its greatest masterpieces redone in the style of Hello! magazine — he announced that he would seek to import fewer international blockbusters and would instead put greater effort into exploring the gallery’s existing collections. In my household, this prompted happy purring. Looking at art should be a gentle, thoughtful process. When I go to exhibitions, I do not want to feel as if I am hunting for bargains at the Primark Christmas sale. I want to feel transported, involved, educated. 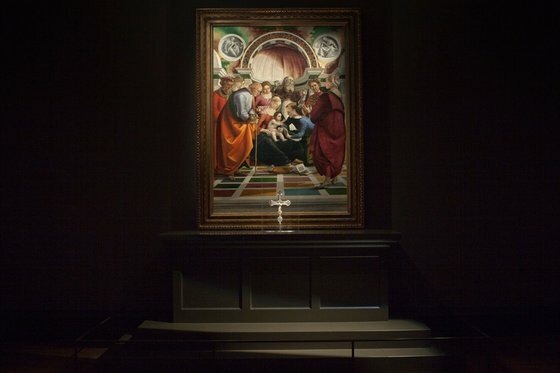 All of which happened to me at Devotion by Design, a particularly hushed examination of the function and form of the Italian altarpiece “before 1500”. The show looks at how altarpieces were made, what they were for, where they went and how they looked originally, compared with how they look now. You may be wondering what happened after 1500 that made it different from what came before. The High Renaissance, that’s what. The Mona Lisa happened. Michelangelo happened, and the Sistine ceiling. Raphael happened, with his pretty-boy looks and palpable Renaissance glamour. After 1500, civilisation got noisy. It’s a process the National Gallery has managed temporarily to reverse here by focusing on a period of art that is rarely focused on these days — too unglamorous, too pious — and by stocking the current show with lesser known works from its own collection by lesser known artists. Some are so lesser known, they don’t even have a name. The Master of the Life of the Virgin, who was from Cologne and painted in the 1470s, gives us a fantastical scene of the baby Jesus, brought into the temple by Mary, in which the Jewish high priest who should have been there has been replaced by a Catholic bishop who should not. The even more anonymous Workshop of the Master of the Life of the Virgin gives us another fabulously informative church interior in which an angel comes down to St Hubert as he is saying Mass. As a gesture of humility, Hubert has kicked off his shoes and stands at the altar in his socks. There is not a picture in this show that is not filled with fascinating detail, if you lean forward close enough to see it. I arrived on a weekday afternoon and the galleries were almost empty. The few visitors who were nosing about among the carefully spotlit religious treasures were invariably silver-haired and hobbly. Which you can see as a sign of cultural failure and disengagement with contemporary values. Or as a God-given opportunity to experience art in the quiet and thoughtful manner in which it is best experienced. I sit immovably in the latter pew. Today, the word “altarpiece” has come to describe any painting that hung above an altar. Originally, it described the entire religious ensemble in which it was presented. All the works under consideration here were originally triumphs of carpentry and decoration, of woodcraft and statuary, of metalwork and goldsmithery. It was only when we began ripping them out of their frames and putting them on show in our museums that we lost sight of their wider religious context. So different, I would describe our current understanding of this masterpiece as a misunderstanding. Take away this much context and you take away the truth. Hardly any of the tens of thousands of Italian altarpieces on show in our museums originally looked anything like they look today. Many of today’s exhibits are mere fragments of larger wholes, dismembered and amputated. Others were framed differently. Presented differently. Arranged differently. Most important of all, they were understood differently. Not as art, but as crucial religious presences, fulfilling specific religious tasks. The opening room makes this evident by featuring scenes of church interiors painted by early Italian and Netherlandish artists, in which you see today’s museum altarpieces in their original church settings. There’s a gorgeous panel by Sassetta showing the funeral of St Francis, taking place before a high altar in Assisi, in which the surrounding church had been painted in those glowing pinks that you only get with pre-1500 tempera. Rogier van der Weyden gives us St Hubert again, being pulled out of his tomb this time, a year after his death, yet still miraculously intact. Both these paintings usually hang upstairs in the National’s main collections. I must have walked past both on dozens of occasions. I half remember the Sassetta: those pinks are too lovely to miss entirely. But I have no recollection whatsoever of the Van der Weyden. By redistributing its possessions and looking at them from new angles, the gallery is rediscovering its own collection. This is brilliant modern curating by Penny and his team. It isn’t only the artists who are unfamiliar. In the show’s second room, we are confronted by two huge freestanding altarpieces that you can actually walk around and see from the back: Giovanni dal Ponte’s Ascension of St John with Saints, and Francesco Botticini’s St Jerome Altarpiece. I have never seen a full-size altarpiece from the back, with all its carpentry showing, the joins, the planking. Both turn out to be complex bits of construction, delivered to the artist fully assembled and offering an unfamiliar gallery duality: magic on the front, gubbins on the back. It’s like encountering a photo of Marilyn Monroe hanging next to an x-ray of her innards. This superb exhibition-making continues throughout, as the show seeks to startle and coax us into extra understanding. Having made vivid how altarpieces were constructed, it goes on to make vivid how easily they could be dismembered: snipped into bits, cut up, redistributed. Many of the National’s best possessions are fragments that never intended to have a separate identity. Although Piero’s great Baptism remains upstairs — fully misrepresented by its current setting! — his St Michael slaying the dragon is here, surrounded by indications of what the painting might have looked like before the dragon was made less dragony and the gothic mood was liposuctioned out. All the way through this display, I had a strong sense of the piety, superstition and, yes, backwardness of pre-1500 Catholicism making a long-delayed return to the story of art. The central gallery here attempts a re-creation of a typical Tuscan church interior by placing a selection of different altarpieces, from different eras, in different styles, above an encircling arrangement of fake altars, culminating in Signorelli’s The Circumcision, hanging above what would be the high altar in a real church. It has monkish chants. Moody twilight. Realistic candles. The idea is to evoke the atmosphere and light conditions for which these pictures were made. And to make clear how the altarpieces were originally mixed up and jumbled. Some may find the results a tad too Madame Tussauds, but not me. For too long, modern art history has missed the point about religious art in general and Catholic art in particular. The unexpected popularity of that moody and popish sculpture show at the National Gallery last year, The Sacred Made Real, with its vivid torturings and lifelike saints, appears to have opened the doors to a fresh acceptance of the Catholic way of understanding. Having been exiled to the margins by modern art history, these old ways of viewing seem to be clawing their way back. To which I say: about time. Forget St Michael dispatching the dragon. This is art history’s id defeating its ego.